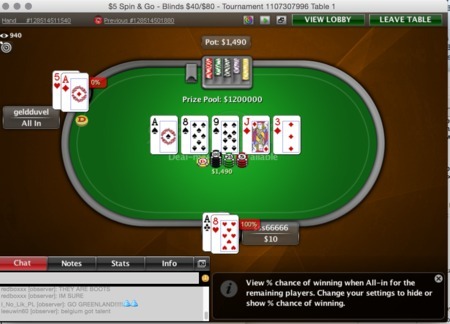 Lottery sit and go (SNG) events have gained a large footing in the online poker industry over the past 12 months. And while analysts once thought the format could bring additional players to the market, many now credit the revolutionary structure for being at least partially responsible for the continued decline of cash games. In danger of dropping to its lowest levels since late 2007 in terms of cash game liquidity, PokerScout says in its weekly traffic report that SNGs might be to blame. The evolution of the sit and go has appealed to players due to its fast-paced nature, low buy-ins, and potential for a huge payout based on the lottery draw prize pool. As a result, the more traditional game of poker has suffered. For the seven-day weekly average through April 28th, just 41,139 players were playing online cash games poker worldwide, a decline of 12.6 percent year-over-year and more than 20 percent compared to 2013. The continued drop has led financial analysts at Morgan Stanley to slash their valuation of the potential Internet gaming industry from its previous estimate of $5 billion by 2020 to $2.7 billion. Though down, the market is not out, according to PokerScout. As players continue to migrate to faster, more lottery-based formats such as PokerStars‘ Spin & Go and Winamax’s Expresso, other networks are quickly trying to launch additional offerings to attract users to their sites. So while some believe the heyday of iPoker has passed, there is reason to believe the cash games slowdown doesn’t necessarily point to a dwindling Internet poker market. Traditional poker players might not be familiar with the novel concept, but sit and gos are actually straightforward and easy to pickup, hence the game’s increasing popularity. While the format can differ slightly from one network to another, lottery SNGs typically involve a buy-in of between $1 to $100, with the lottery element being that the prize pool is randomly drawn. The lottery decides whether the buy-in is multiplied anywhere between two and upwards of 3,000 to 5,000 times, meaning a $1 buy-in could result in a $3,000 to $5,000 payday. Of course, it’s much more likely that the multiplier will only be doubled or quadrupled, but the draw still gives players another element of excitement. The three-max turbo game provides players the same identical starting stacks, with levels being completed in just minutes, and only the winner receives an award for his or her play. SNGs are fast, exciting, and rewarding, and potentially a long-term asset to iGaming’s overall health. Regardless, they appear to be here to stay.